We left Santa Cruz marina at 9:30 this morning. 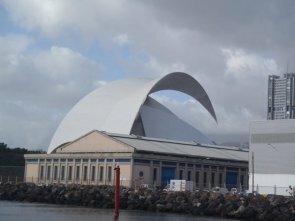 This is the impressive looking auditorium at the marina entrance, Tenerife's version of the Sydney opera house. We are now safely back in Las Palmas, moored at the visitors berth while we wait for the wind to subside so we can return to our allotted berth without doing any major damage to ourselves or surrounding vessels. We have just been out for a goodbye dinner with Rebecca, Algy and Jonathan. The food was nice, if unexceptional, but the english version of the menu had us in stitches. I hope they did not think us too rude, but we just could not stop laughing at menu items like "Landfill of hake with mashed dads". Eventually they brought us the spanish menu, which we could actually understand better than the english one. The Edwards fly out tomorrow evening and we have to go back to preparing Anastasia for the Atlantic crossing. There is still no news on the replacement wind instruments.